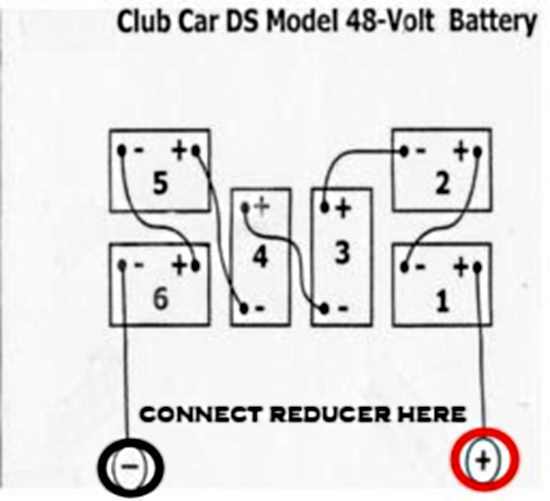 If you want to add a radio or a light kit to your 48 volt Club Car DS golf cart you will need a voltage reducer or converter to use all batteries equally. This image shows you where to connect the wires from the 48v to 12v voltage reducer to the battery posts. If you don’t use a golf cart voltage reducer you run the risk of damaging the Club Car’s electronics and also causing problems with your batteries. I is also a good idea to have the proper sized fuze installed on your new wiring connections to protect the new electronics from any excessive surge in power.